My neighbor has furniture and other bulk items in front of their house, who can I call to have it removed? All litter related calls are handled by our Litter Prevention Coordinator at 864.467.7289. I'm tired of seeing trash on the side of the road, what can I do? 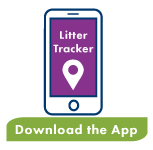 Be a part of the solution and volunteer now by downloading our litter ends here app. How much does it cost to participate in the Adopt A Road program? Participating in the Adopt A Road program is on a volunteer basis and is completely free. Litter is a social problem that affects us all. It's up to us as a community to come together to end litter. Will you do your part? What do I do with my electronic waste items such as televisions and computers? All E-waste items must be brought to one of our Residential Waste and Recycling Centers. For more information such as locations and hours click here. For more information on E-waste, click here. Why should I report litter being discarded or blown from a motor vehicle? Littering from motor vehicles is a major contributor to roadside and community litter. Litter can cause significant environmental harm and is a serious environmental offence. Roadside and community litter is unsightly and cleaning it up poses a significant cost to local governments and the community. Why do I have to provide my personal details when making a report? Greenville County is now issuing penalty notices based on public reports and you are a witness to the offense of littering from a motor vehicle. Greenville County may need to contact you if the offender elects to have the matter dealt with in court. If this is the case, you may be required to attend court as a witness to the offence. Who will have access to my details? Greenville County will have access to your details, and will not release your details to anybody outside the county unless the matter is to be dealt with in court. The South Carolina General Assembly recently enacted Act 214 of 2018, amending Section 16-11-700 of the state litter laws. This action by the Legislature was done in an effort to give magistrates and municipal courts greater flexibility in the prosecution of litter cases. The new law makes it easier to achieve court-ordered community service/litter pick up by removing the requirement for supervision. Act 214 also "makes the penalties fit the crime" by classifying violations into distinct categories as shown below and providing for a definition of litter. Persons convicted of placing litter, as defined, on public or private (littering) property must remove that litter and shall be fined not less than $25 and not more than $100, or up to 30 days in jail, and the court must impose eight hours of "litter gathering or other form of community service". For persons convicted of placing garbage in another person’s private facility, such as a private dumpster, the fine is not less than $50 and not more than $150, and the court shall impose a minimum of 16 hours "litter gathering or other form of community service". Additional hours of community service may be imposed in lieu of the monetary fine. Persons convicted must be fined not less than $200 nor more than $500, or up to 30 days in jail, and the court shall require 16 hours of litter gathering or other community service. Community service increases to 24 hours upon a second conviction, and 32 hours for a third conviction within five years. Persons convicted must be fined not less than $500 nor more than $1000, and up to a year in jail. The violator also may be ordered to remove the dumped litter, pay damages, and perform community service. The court may enjoin a violation of more than 500 lbs, and may seize vehicles or equipment used for dumping. If a person sustains damages in connection with a violation of more than 500 lbs that gives rise to a felony against the person or his property, a court, in civil action for those damages, shall order the wrongdoer to pay the injured party triple damages up to $200, along with court costs and attorney’s fees. Fines for dumping more than 500 lbs of litter may not be suspended.